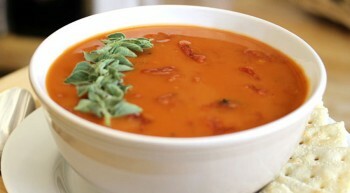 Vanee Condensed Tomato Soup has a fresh tomato flavor with a rich, full-bodied mouth feel. Perfect in a bread bowl, alongside a grilled cheese, or use it as a base for a signature soup or entrée. 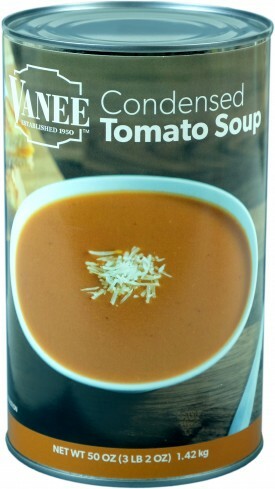 Vanee Condensed Tomato Soup contains no high fructose corn syrup, no added MSG, and saves valuable freezer space by being shelf stable. Each 50 oz. can has 12 single cup (prepared) servings, for total of 144 servings per case. 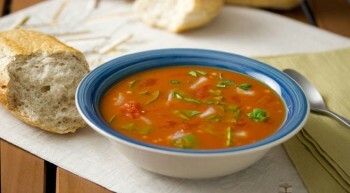 Great in a bread bowl, with a grilled cheese sandwich, or as a base for a signature recipe. 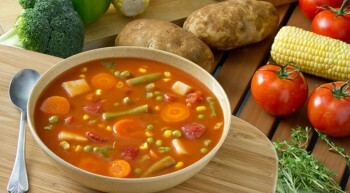 Preparation: Combine one can of condensed soup with one can of water. 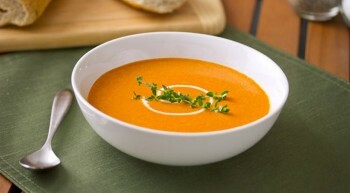 For a creamier soup, replace water with milk. Convection: Place covered prepared product into 300°F oven for 30–40 minutes until center reaches 165°F. Conventional: Place covered prepared product into 350°F oven for 60 minutes until center reaches 165°F. Microwave: Place prepared product into microwave safe covered container. Heat on high approximately 2–3 minutes per portion or until center reaches 165°F. Stove Top: Place uncovered prepared product over medium heat for 10–15 minutes or until center reaches 165°F, stirring occasionally to prevent scorching. Tomato Puree, Water, Enriched Wheat Flour (Wheat Flour, Niacin, Reduced Iron, Thiamine Mononitrate, Riboflavin, and Folic Acid), Sugar, Salt, Palm and Soybean Oil, Citric Acid, Onion Powder, Spice.